Grill hamburger patties, bacon, and onions on a hot grill. Cook about 6 minutes on each side, add cheese during last 2 minutes. Just before hamburgers are done add pineapple rings to grill and cook 2 minutes per side. 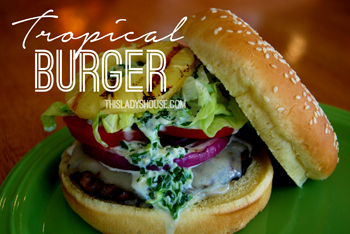 Build hamburgers with grilled bacon, onion, pineapple, lettuce, tomato, and mustard.Top with Lemon Coconut sauce.